Each year, the Bloomington Symphony Orchestra is thrilled to partner with the Bloomington Public Schools Orchestras at the Bloomington Orchestra Festival. Players from fifth grade to professionals join in an evening of incredible music-making! This year’s Festival will be held on Monday, March 17 at 7 p.m., and will be held at the Jefferson High School Auditorium. 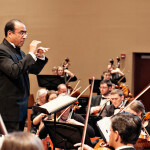 The Bloomington Symphony Orchestra will open the concert with Richard Wagner’s Overture to Rienzi, followed by a side-by-side performance with the string players from Jefferson and Kennedy High Schools. The mass orchestra will perform the fourth movement from Beethoven’s Fifth Symphony. Performances by string players from the district’s fifth through twelfth graders will follow. Tickets will be available at the door. For more information, please contact info@bloomingtonsymphony.org or any of the Bloomington Public Schools orchestra teachers.